Every time I had my Amiga 4000 offline without power for a while it lost both time and date settings. 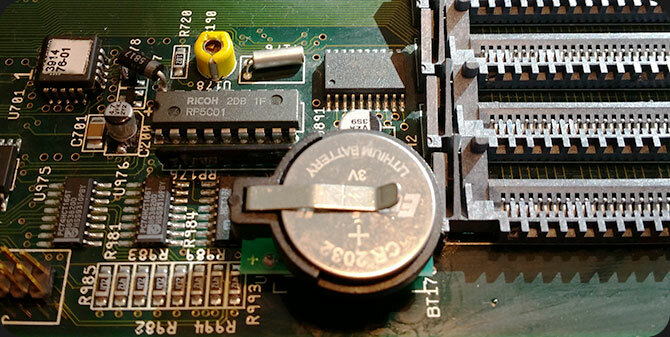 This is very frustrating and since I do like to modify my Amiga to the better I decided to change the current clock battery to the lithium coin cells that Amigakit sells. I ordered two of them and received both of them the week after. What I did not see when I ordered them was that it was included with a battery. I know, the picture showed a battery. But how many times haven’t you bought a product with a battery showing on the picture and it was not included? The removal was fairly easy but you have to remove the mainboard from the chassi since it’s hole through. Well, this picture speaks for itself… The new coin cell battery is in its place and it works as it should. The good thing with this one is that its easy to change battery in the future.